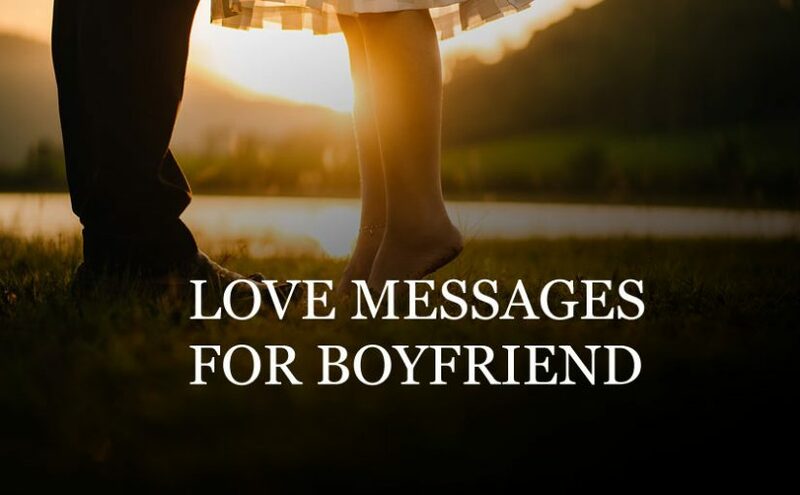 Love Messages for Boyfriend : Maybe you feel so much emotion about your boyfriend but you can’t able to express as like you feels the love for him. Generally, boys may not be the most emotional in nature. So, to show how your heart beats for him you may send some sweet and romantic love messages to your boyfriend even you can send some Flirty Text To Him if you are in a funny mood. Texting is the best way to express one’s unspoken words of mind. 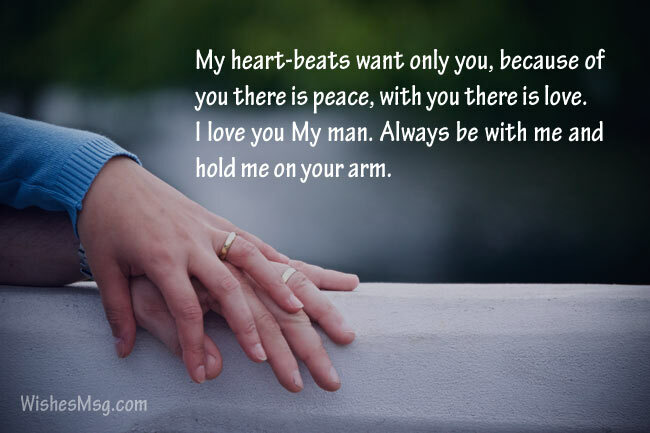 With these heart touching messages show your care about your beloved boyfriend in the most romantic way. Here we provide some lovely, heart touching, sweet and emotional love messages for boyfriend to run his emotions. These sweet love messages will make him love you more! Just copy and paste one of these you seem perfect and make your guy feel your cordial love. Even a thousand sun cannot shine brighter than your smile. You light up my life in every possible way. Never stop doing that! You are the sweetest beginning of a never-ending love story. 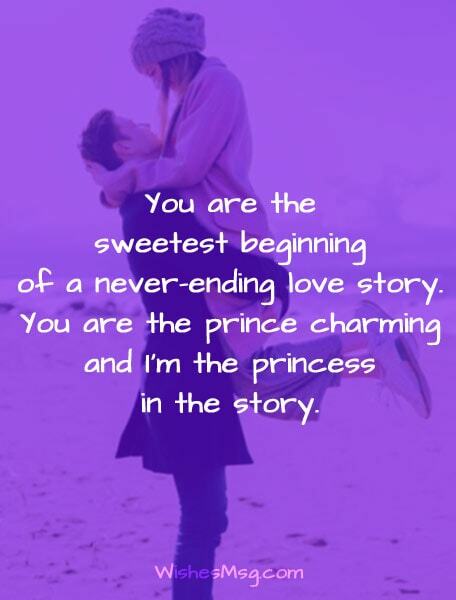 You are the prince charming and I’m the princess in the story. Only you can kiss me a thousand times a day and every one them would feel like the first kiss I ever had in my life. Every time I try to keep my heart away from you, it revolts and escapes. My heart finds you and wants to be locked up in you forever! Since I met you, I haven’t spent a single moment without thinking of you. You are in my thoughts, in my heart and in my mind always. In your arms, I have found a perfect hiding place for me. I can avoid the rest of the world and still feel like I have everything right here, right in your arms. I was so used to seeing clouds that I forgot how a deep blue sky would look like. I love you for being the deep blue sky of my life. I was a nobody going nowhere. But you made me feel like the luckiest girl in the world. Your love is what I need and what I want for the rest of my life. You did the unimaginable to have me in your life. Now that I’m in, I promise I will do everything to keep you in my life! It feels like yesterday that I used to dream for being with you for the rest of my life. Now, I wake up every day knowing that you’re a part of my life. Whenever you hold my hand, something in me says we’ll never let go of each other no matter what comes before us. I have seen amazing things, I have known wonderful people but I have never known a more beautiful soul which can love so deeply and truly. You’re that chocolate that gets sweeter with every bite. You’re that sweet smell that gets stronger with every breath! Because you are in my life, every morning for me is a sweet morning to wake up and be thankful to God. God is kind because he blessed me with you! I may not be the perfect girlfriend, but I know how to love you like no one does and no one will never do. Because I love you more than myself. My life is a garden and you are the most colorful flower I have in it. I’m lucky that I have you in my life. Stay with me forever! My love for you is deeper than the ocean. You can see it if you look right into my eyes. You’ll know how madly I’m in love with you! You’re not a wizard. But your eyes had me spell-bounded right from the moment I met you. Tell me its love, not an illusion! Even if I had to die a million times to be with you forever, I’d gladly accept the deal because I love so much dear. My love for you is never-ending. No matter how hard life becomes for me, I’d never settle for anyone in life other than you! I don’t know what I have given you in return to your unconditional love for me. But do know that, you’re the only one that occupies my entire heart and my soul. You blessed me with so many happy moments that I can literally bury my sad memories beneath them. Ever since you have come into my life, I have been living a different life in a whole different world. The only thing that exists here between You and me is happiness! Nothing in this world can ever keep us apart from each other. We may sometimes fight with each other, but we also know how to fight for each other. They say true love only happens once in your life. But for me, it happens every day and every moment I see you. It’s not just my eyes that want to see you. It’s my mind that never stops thinking of you and my heart that always wants to belong with you! Whenever I see you, I know I belong to the right person in this world. And I know this right person will never let my heart bleed ever. My love for you is always true and pure. And I know true love never disappoints the lovers. We’ll always be together no matter where life takes us. My definition of life is you. My sweetest dreams are the ones with you in them. My heart belongs to you and my soul craves for you! Your love is the reason why my days are so full of colors, my nights are so full of dreams and my life is so full of happiness! I’m promising you I will always love you and be a strong support for you until the day I take my last breath. I want to see the last sunset of my life with you. Never leave me. I love you a lot. 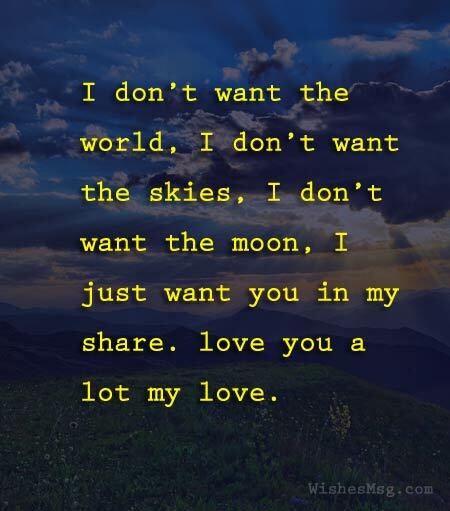 I don’t want the world, I don’t want the skies, I don’t want the moon, I just want you in my share. Love you a lot my love. Oh my love, how should I make you understand the talks of love? I remain awake all night and these eyes bow down to you. Can you realize how much I love you? Hello my heart, Do you know that you are the only reason of my sadness and you are the only person in the whole world who can make me happy. I love you! Sometimes I try to find out the reason for which I should stay in the world. Then get understood you are the only reason for my living. I love you! I have no demand to you. My only demand is “You”. Please hold my hands forever and never let me go. I am still here fighting for you, for our relationship. I badly need you my love. Since the day you entered my life, every day is full of joys and happiness. I want to be with you until the last day of my life. You are my heart. Before you come to my life I never feel like this. All the moment I feel you and when I close my eyes there is you who have the sweetest smile. Goodnight Mr. Handsome! Have a sweet dream and if you try to look for any girl in your dream, then I will be there and must kill the girl. LoL. Love you. My heart-beats want only you, because of you there is peace, with you there is love. I love you, My man. Always be with me and hold me on your arm. In a single sight what magic have you done! My heart has become yours now. I can’t think anything without you. I just love you badly. The simple three words “I love you” will never express how much I love you. My love is so deep that I feel I love you more than I love myself. Do you know my dear if someone asks me that, what did you achieved from life? My answer will be “You are my only achievement”. I love you madly. Don’t talk to any other girl. I’m just crazy about you. I can’t tolerate any girl around you. You are only mine. I love you! Yesterday you were mine, Today you are mine and tomorrow you will be mine. You are only my asset. And I will hold you every day. l love you. You are a dream and I am the sleep, Night becomes complete when both of us meet. I will pray for this every day, that both of us unite. I love you a lot dear. Why don’t you understand? Didn’t you know I am crazy about you? So, why you put me in such pain. Come back, my love. I missed you a lot. In every prayer of mine there is love for you, Moments being difficult without you. Come back my dear and make feel my heaven. l love you crazily. Hello Mr! Do you still angry with me? Listen, only I have the right to fight with you and I am the only one will love you forever, please be calm my love. I love you so much. I love you, there is nothing exist for me without you and I can do anything for getting you. The happiness and fun exist in my life now these are only because of you. You are the best experience of my entire life. Do you know my dear? We are made for each other. You are my soul mate. I will always be yours, even when you don’t want me. You make me feel safe all the time. Please never make any scope to miss you. Always be with me. My Handsome. I love you so much. I don’t know how you got inside my heart, but know that I’ll never let you go. Loving you is a mandate for me and I will love you forever. Love is life. As your life needs care also your relationship. Hope these love messages for boyfriend will help you make some romantic memories with your beloved. Choose the best and share via Facebook, Twiter, Email, Google Plus or where you like.